The 13th Hussars was stationed at Meerut (Uttar Pradesh, India) when Britain declared war on German on 4 August 1914. The Regiment had arrived in India on 1 October 1904 from England and had previously been stationed at Secunderabad (Telangana, India). The Regiment received orders to mobilise on 24 October 1914 and left India for France at Bombay (Mumbai) on 19 November 1914. The history of the 13th Hussars during the First World War can be divided into two distinct stages, the first on the Western Front and the second in Mesopotamia (Iraq). The 13th Hussars landed at Marseilles on 14 December 1914, the Regiment having passed through the Suez Canal on its journey to the Western Front. The 13th Hussars served on the Western Front as part of the Meerut Brigade in the 2nd Indian Cavalry Division between October 1914 and June 1916. By the time the 13th Hussars had arrived in France, a series of trenches had been established from the Swiss border to the Belgium coast. This meant that the Regiment could not be used in its traditional mounted role and there is very little to report during this period. By January 1915, the 13th Hussars had moved into billets at Enquin-les-Mines, a French village 48km north-west of Arras. For the next year and a half, the 13th Hussars spent most of its time in billets behind the front line. The Regiment’s exact location can be followed by consulting its war diaries (see below). While the 13th Hussars spent most of its time behind the front line, in common with other cavalry regiments, it also took turns in the trenches. For anyone wishing to know more about the Regiment’s activities on the Western Front, I’d highly recommend turning to the regimental history (discussed below). On the 26 June 1916, the 13th Hussars left France for India and arrived at Bombay on 15 July 1916. However, the Regiment did not stay in India for long as on 19 July, it set sail once more, this time for Mesopotamia. The Regiment landed at Basra on 25 July 1916 and served with the 7th Indian Cavalry Brigade for the remainder of the war. 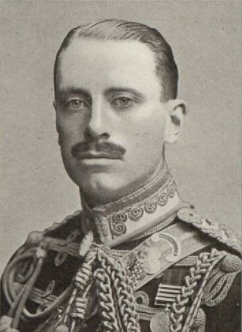 Following the fall of Kut-al-Amara in April 1916, General Maude set about reorganising the forces under his command during the summer and autumn of 1916. On the 13 December 1916, General Maude launched his offensive which would see his Anglo-Indian force enter Baghdad on 11 March 1917. The 13th Hussars played an active role in the advance towards Baghdad and its actions are described in detail in the regimental history. The Regiment was involved in the Fight at Lajj on the 5 March 1917 described in the regimental history as “one of the most memorable in the history of the Thirteenth”. During the battle, the 7th Cavalry Brigade engaged the Turkish rearguard blocking the route to Baghdad. 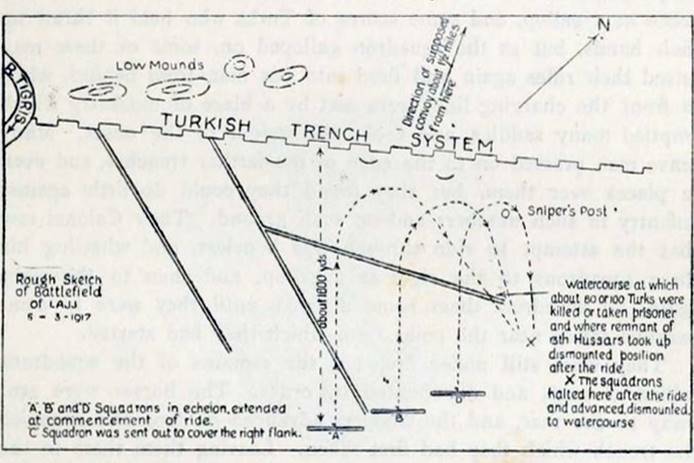 Coming under fire, the 13th Hussars charged and took a watercourse but could not make headway against a strongly held Turkish trench system beyond. The Regiment then dismounted and engaged the Turkish forces until the 6th Brigade was able to outflank the Turks and force their retreat. The 13th Hussars suffered heavy casualties at Lajj, of 9 officers and 77 other ranks. The map below is taken from the regimental history. The 13th Hussars was involved in the occupation of Baghdad and for the rest of the year moved frequently. During the summer of 1917, the Regiment occupied a standing camp at Chaldari, nine miles north of Baghdad by the Tigris River. Two squadrons of the 13th Hussars were involved in the capture of Tikrit on 5-6 November 1917, when another cavalry charge was made. The 13th Hussars sustained 6 killed and 22 wounded during the charge. The 13th Hussars moved to Sadieyh after the fall of Tikrit where they encamped until mid-April 1918. The 13th Hussars saw further action at Tuz on 27 April 1918 and during the Battle of Sharqat (23-30 October 1918) where the regiment made a dismounted charge to capture Turkish guns near Hadraniyah. Both actions are described in detail in the regimental history. After the Armistice with Turkey, the 13th Hussars remained in the vicinity of Mosul, until it returned to Baghdad in January 1919. The Regiment remained in Mesopotamia until March 1919, when it returned to India and subsequently to England where it arrived at Liverpool on 29 April 1919. 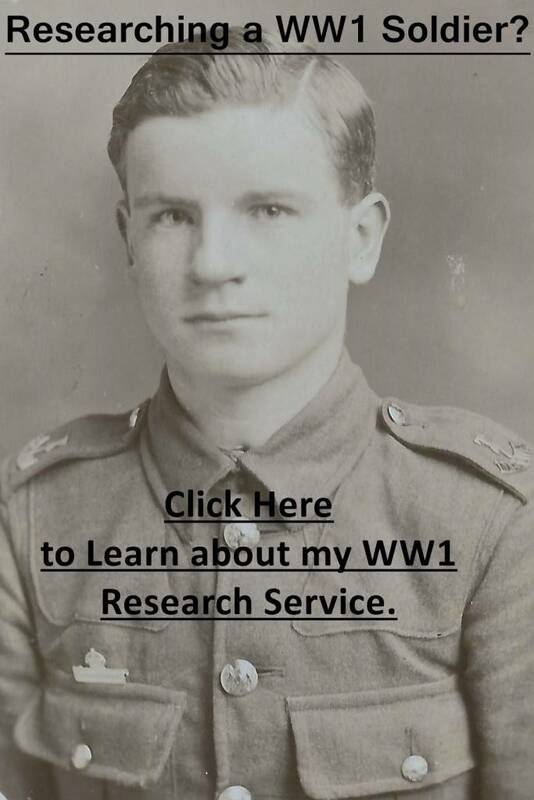 The first two steps you need to take is to look at my Guides to Researching WW1 soldiers and the excellent regimental history The Thirteenth Hussars in the Great War. These guides will help you find service and medal records for soldiers who served in the 13th Hussars. The regimental history contains a roll of all officers and men who served with the regiment with additional information. In addition, I would suggest downloading the two war diaries which I’ve listed below. If you’re researching an officer or other rank who served in India with the Regiment, check the 1911 Delhi Durar Roll (free to download). By combining the 13th Hussars’ war diaries with the regimental history, which is 600 pages in length, you’ll have an excellent overview of the service of the Regiment during the First World War. The regimental history also contains dozens of photographs which will be of interest. Officers: First, search to see if a service record of an officer is held at the National Archives. I offer a copying service for these records. If an officer served past April 1922 then their service record should still be with the Ministry of Defence. I have written an article about ordering these files on my Second World War website: Ordering a Service Record from the MOD. Officers of the 13th Hussars are usually easy to research and if you are after a photograph look at the regimental history (see below) as it contains dozens of officers. The regimental history also contains lots of quotes from officers, awards and honours and information about those who were killed, wounded or taken prisoner. This photograph of Captain Willoughby Arthur Kennard was published in The Tatler after he was wounded in 1914. Note he wears the Queen’s South Africa Medal. Newspapers are a fantastic resource to use when you’re looking for a photograph or information regarding a casualty or gallantry winner: How to Research Soldiers using Newspaper Reports. Other ranks: The first step is to see if a service record has survived, though is a soldier served past January 1921 it should still be with the Ministry of Defence. I’ve written a guide to ordering these files on my Second World War website: Ordering a Service Record from the MOD. If no service record has survived an enlistment date can usually be worked out provided the regimental number is known by looking at surviving service records to soldiers of the Regiment. The regimental history contains a roll of all soldiers who served with the regiment during the war, including whether they only served in France and if they became a casualty or were awarded a gallantry medal with the date recorded. The history also contains photographs of many other ranks casualties and gallantry winners and quotes from their letters. To research either an officer or other rank who served with the 13th Hussars, you’ll need to search the records on Ancestry and FindmyPast. Both sites offer a free trial and clicking on the banner below will take you to FindmyPast. There are two war diaries for the 13th Hussars and both have been digitized by the National Archives. To download each war diary for a small fee click on the blue links below. Notes: A very poor war diary, though August 1915 contains some detailed entries, where most entries consist of just “Billets”. There are no appendices. Notes: A much better war diary with some very detailed entries (especially for 5 March 1917) up until May 1917. After May 1917 entries become a lot briefer and include a lot of “encamped” though April and May 1918 are more detailed. There’s a wide variety of appendices including a copy of the Standing Orders of the 7th Cavalry Brigade, 1 August 1917 and a map of Balad Ruz-Mendali dated 5 October 1917. Also, a detailed account of the 13th Hussars’ attack on 29 October 1918. If you’d like to learn more about the role of British cavalry in trench warfare on the Western Front I’d recommend Horsemen in No Man’s Land: British Cavalry and Trench Warfare 1914-1918 by David Kenyon. … When I got up to it we were challenged by the post of the Regiment that we were relieving, and then I went up to them. I asked if they were all right. In a very despondent voice he replied, ‘I’ve two men nearly dead with cold: they are both unconscious, and I don;t know how I’ll get them back.’ Just at that moment one more man went over flop. I thought this was a jolly start, as I was going to be there all night and these fellows had been there in the day. We had great trouble to get them out, as the trench was knee-deep in the most holding mud I had ever met. It beat Wadhurst clay by three stones and a distance. Another difficulty was the fact that the Germans, who were about 600 yards in front, or perhaps a bit more (people are talking all round me, and I keep writing what I hear) kept on sending up ‘Very’ lights and star-shells, which lit up the whole place far better than it was lit up in the daytime. Owing to the snipers, who were lying up all over the place, we had to drop flat as soon as we saw the light go up, and stay there for about a minute after it had gone. Then I got into the trench, which was bisected by a stream which was just over knee-deep. I put four men one side, and four with myself the near side. I had orders to keep on sniping all night so as to annoy the Germans, so I had one man of each four on sentry for an hour at a time, with orders to shoot about once every five minutes. Of course I could not sleep myself, but I lay down in the wet mud. The trench was over ankle-deep in mud and water, and only just long enough to hold us all. About midnight it got most damnably cold, and I issued the men milk chocolate, and gave them each a tot of rum from a flask I’d got. The snipers kept on shooting at us, but mostly went over, though a few bullets did hit the trench. One horrid fellow, whom we called Bert, was behind us somewhere, and made me very angry. At 3 A.M. we heard the devil of a battle going on a long way off, machine-firing guns going rapid and a rattle of musketry. This went on for half an hour, and then one or more of our big guns somewhere behind us started firing occasional shots. It made a most colossal row, although it must have been at least half a mile away.